It’s that time again! Yes, booking for 2018-19 Instrument Lessons goes live on Wednesday 16th May 2018 at 7pm! Music is at the very heart of life at Cannon Lane. The school has an enviable reputation within the borough for excellence in music. It is our belief that music can play a huge role in the emotional and analytical development of every child. Therefore, all children across the school participate in performing, creating and responding to music. 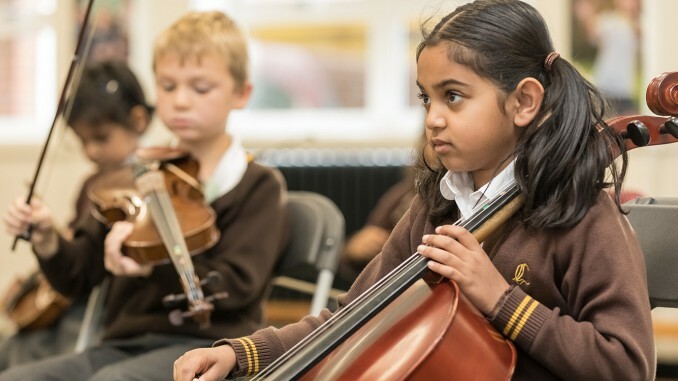 Children in KS2 have the opportunity to undertake instrumental lessons at school. Over two hundred children currently study at school, with many more learning externally. As a consequence the school boasts a number of ensembles including a chamber choir and orchestra, string orchestra, wind band and steel pans band. Singing is central to musicianship. All children take part in weekly singing assemblies performing music from a wide range of genres, with a focus on healthy vocal development. The Cannon Choir meets after school each Monday and has 80 members, performing at many events across the borough. Creativity is at the centre of the curriculum during academic music lessons. All children learn how to put theory into practice through improvising and composing their own compositions. In January 2017 we established a lunch time Composers Club to encourage and support aspiring young music makers. There are numerous performance opportunities for our children. Friday Spotlight offers children the chance to showcase their endeavours in a weekly assembly performance slot. The school take part in all the major events hosted by the Harrow Music Service, including Band Festival, School Choir Showcase, String Festival, World Music Festival and Song Fest.